I’ve always though of turnovers as winter foods. No logical reason for it I suppose, but it just seems like a winter food to me. However, I was debating between two recipes with very similar ingredients: a southwest quiche, or Summer turnovers. I went with the turnovers. First step is always making the dough for the turnovers – in this case a basic pie-crust/pastry dough. Start with 1 cup flour and cut in about 4 tablespoons salted butter. You can use a fork but investing in a pastry cutter is a very very good life choice. Once the butter is all mixed in, add water, a little at a time, and mix until it all combines. Always add water in small amounts, otherwise you risk using too much and that ruins the dough. Step two – the filling. 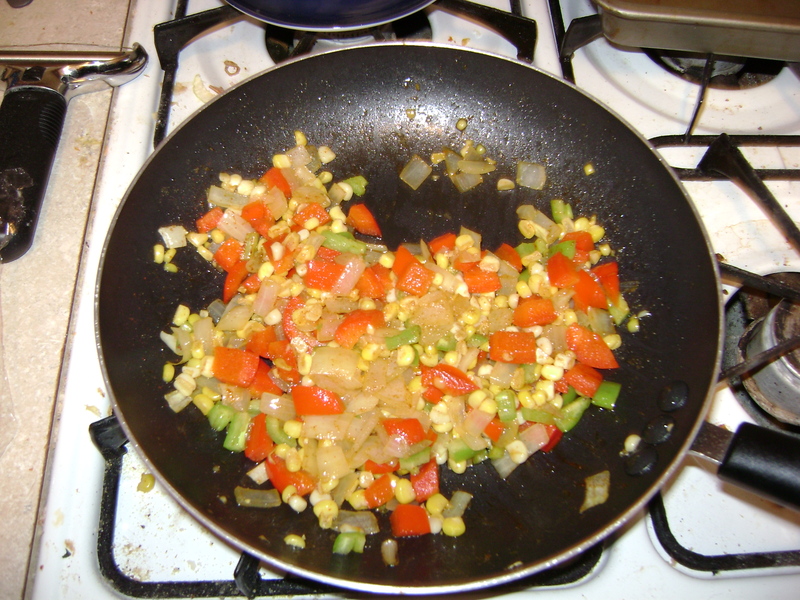 Saute chopped onions, chiles (as per usual I used anaheim chiles), bell pepper and corn. Add cumin and cayenne to taste. I actually bought cayenne as I finally ran out of paprika and, well, it has more of a kick. Assembly: divide the dough into 4 or 5 balls. Roll out into circles. Fill with some of the filling and shredded cheese, I used sharp cheddar. Seal the edges of the turnover, and brush with an egg wash. Now, I’d never made an egg wash before, and I don’t have a pastry brush. 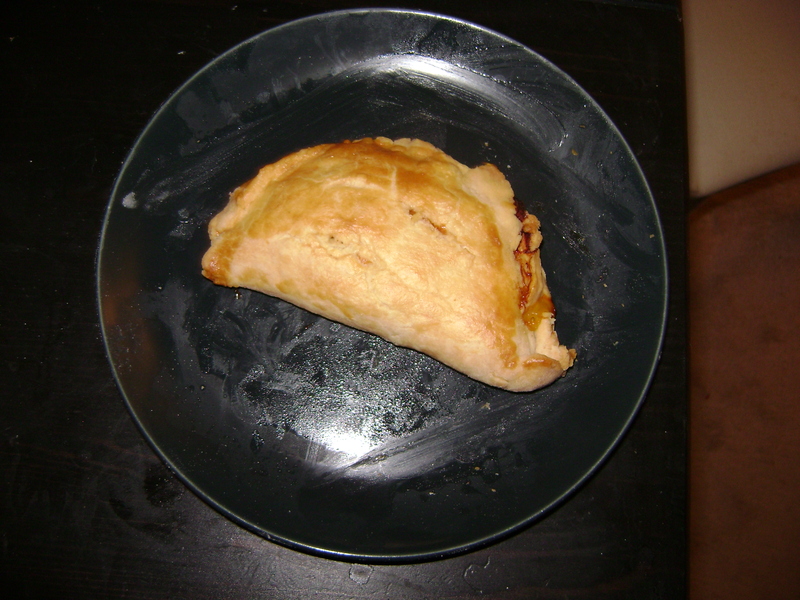 So I beat and egg with some water and carefully poured in on the finished turnovers and spread it (sorta) with a fork. It kinda worked, but not the best choice I’ve ever made cooking-wise. Cut slits on the top of the turnovers, and bake at 400 until golden brown. These were good, but the pastry was what made them wonderful. The filling itself had more of a kick than I expected – way more of a kick actually. Too much so for me to enjoy eating the filling by itself. But, when combined with the pastry and the cheese it all mellows and evens out in a very happy way. Be careful reheating leftovers though – the crust gets kinda limp, rather than crisp if you microwave it several days after baking. Sometimes I decided what to cook solely based on what happens to be in my fridge at the time. 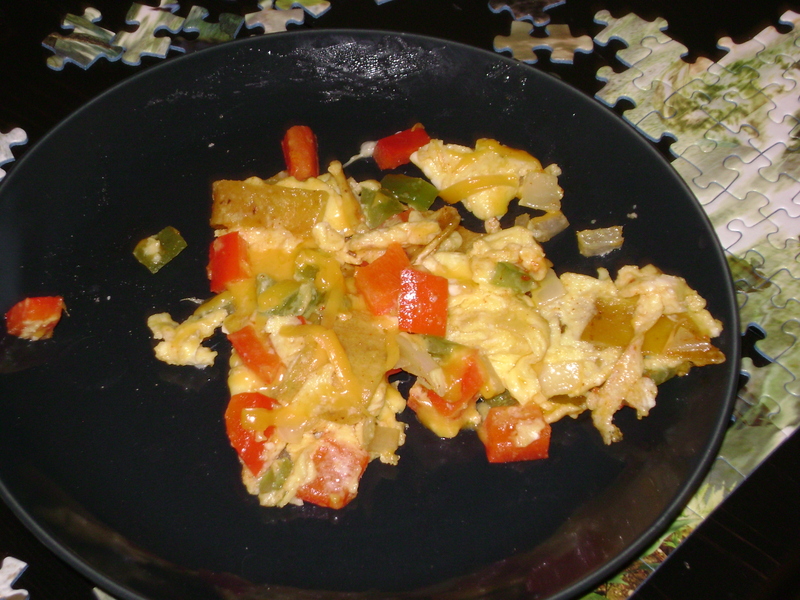 Due to the leftovers from making enchiladas, I had the exact right ingredients to make Mexican scrambled eggs. Like the enchiladas recipe, this one came from the Greens cookbook. Its intended to be a brunch recipe but I didn’t decide on making it til mid-afternoon so I had it for dinner, which works too. The beauty of this recipe is that its so simple. Chop chiles, in my case anaheim, red bell pepper and onion. Saute. Add chopped pieces of tortillas. Saute for a bit longer than add the eggs, cumin, pepper and cayanne to taste. Cook the eggs. Making scrambled eggs just involves constantly stirring so that the uncooked egg moves gets contact with the frying pan, and the cooked egg doesn’t burn. The stirring also makes it fluffy. Once the eggs are almost done cooking, add cheese and finish cooking. Top with salsa and serve. Such a simple recipe, and yet so good. Totally worth trying for brunch, dinner or whenever you are hungry and need something both fast ad delicious. So for Cinqo de Mayo I decided I had to do a Mexican recipe. Not that in reality Cinqo de Mayo has anything to do with Mexico and is mostly so that Mexican-Americans get a holiday and everyone gets an excuse to drink tequila. But any excuse to cook something different is a good excuse and this was no exception. So I looked through my Greens cookbook, cause what better place to find a good recipe than a cookbook from a San Francisco restaurant? The decision: enchiladas verde. The filling was extremely straightforward. Saute onions, garlic, and fresh corn. After a while, add chopped zucchini (a very standard vegetable used in Mexican cooking), and chopped chiles. The recipe itself called for various types of chiles, but I have an admittedly low spice threshold, so I used a fresh Anaheim chile, which is flavorful, but mild enough for me to handle and is my go-to chile. Season to taste with salt, pepper, cumin and cayenne (for which I substituted paprika, cause that’s what I had). Assembling: So when making enchiladas, you are supposed to dip the tortillas in extremely hot oil, in order to make them pliable. This seemed unnecessarily caloric to me. So instead I just heated the tortillas up in the microwave. They are more prone to falling apart that way, but its faster and less bad for you so its worth it in my book. With the warm corn tortillas, add some filling and shredded cheese, I used cheddar. Take the pan you are cooking the enchiladas in and pour a layer of verde sauce on it. Greens has their own recipe for verde aka tomatillo sauce, but I was not about to make that from scratch. For one thing, the tomatillos back home in Cali are way cheaper than they are on this coast. So I bought a jar of salsa verde and used that instead. 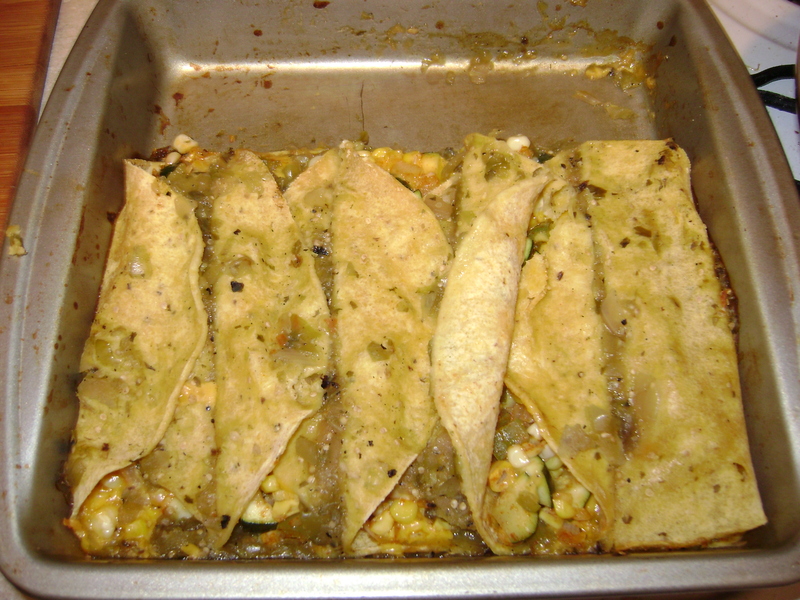 Place the assembled enchiladas on the sauce-covered pan, and then cover with more salsa verde. Cook covered for about 20 minutes or so. Once they are done, sprinkle with more cheese, serve, and eat. I was never a fan on enchiladas growing up. Whenever my mom made them, I’d complain or eat them without the sauce. Upon reflection, I probably just hated the enchilada sauce she used. However, these were delicious! Big fan. Will definitely make again. I paired the enchiladas with a solid summer beer. Beer, particularly wheat ales, cut through spiciness well and provide a good complement to Mexican food. Of course, I’m sure margaritas would work reasonably well also.